Becky Bedbug: Curvissa: Awesome clothes for plus size girls! Here's the deal: I love clothes. I mean, I really love clothes. However, as you may have noticed, I'm a little on the tubby side. This makes buying clothes a bit of a pain for me and I tend to buy items that are too small, squeezing myself into them determinedly. But, luckily for me, there are a few places that realise that some of us might need a little extra fabric around the chest and thigh area (or tummy area, or arm area, or hip area...). I know it's approaching winter, and swimsuit weather seems a long way off, but this Lascana swimsuit is too cute to resist, right? I'm well prepared! This spotted dress is right up my street. 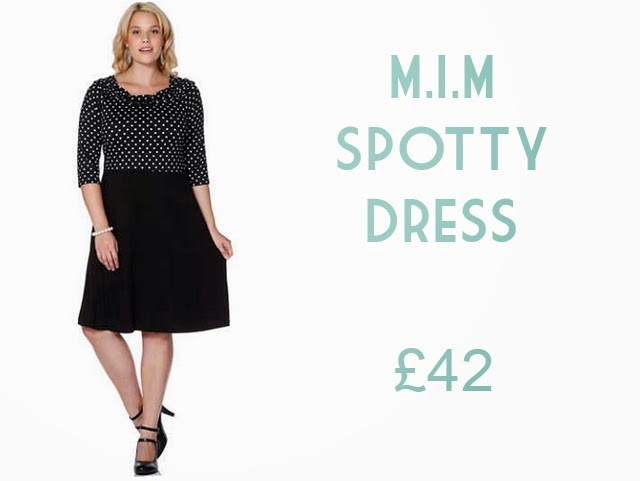 I love polkadots, I love monochrome and it would be perfect for work! I've been looking for the perfect pair of suedette boots forever! Unfortunately, I can never find a pair that fit my chunky calves. I think I've found the pair! The autumn/winter advert shows off some of the other items and it's making me pretty excited for autumn. Snuggly jumpers, wrapped up in scarves, golden leaves scattered at my feet. Lovely! If the advert has tickled your fancy, you can read all about the filming of it on the Curvissa blog, with loads of behind-the-scenes gossip! Take a look and prepare yourself for the colder weather. Don't forget to tell me what you've bought! Yes, this is posted in collaboration with Curvissa, but I really do love Curvissa. If you'd like to see your brand on Becky Bedbug, take a look at my sponsor page.